It’s mind boggling that we had illegal aliens fearlessly protesting in front of the White House… home of the guy ultimately in charge of enforcing our law. They demand a seat at the table at any decision concerning the outcome of illegal immigration. Though it was known they were illegal aliens… apparently they needn’t fear arrest. 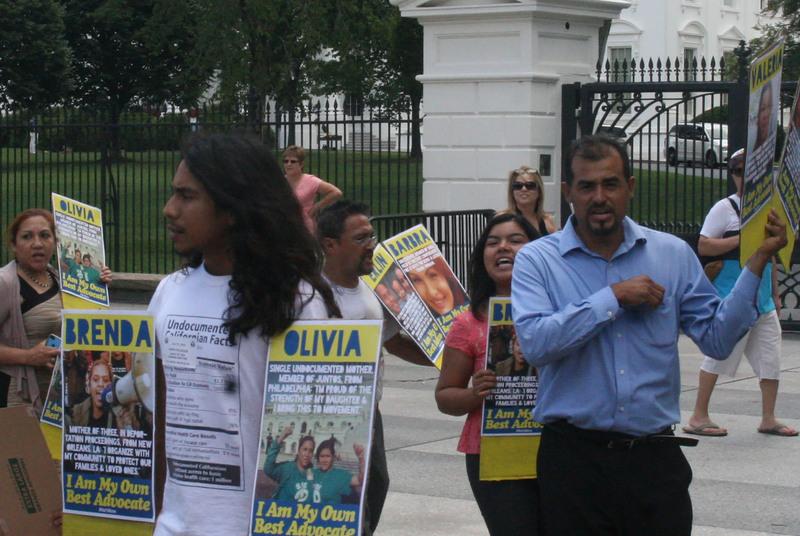 Phoenix resident (illegal alien) Gerardo Torres, right, joins protesters at White House demanding that undocumented immigrants be involved in administration meetings on immigration policy. Notice I’m referring to them as illegal aliens instead of a nice euphemism. Calling a citizen of another country that breaks into ours illegally “an undocumented immigrant” is like calling someone that breaks into your house an “unrecorded home-owner”. The fact they’re raiding the fridge and sleeping on the couch does not give them legal standing to decide whether or not you kick them out. If that seems confusing given many now pretend it is “racist” to treat illegal aliens as, well, illegal aliens… try breaking into Mexico (or any other nation, they just happen to be nearby), and go to the capital and protest outside the mansion of their chief executive. Loudly demand a seat at the table in the executive office to decide your own fate.